This series was put together from one of my extended graduate school research papers. The sources used were the current research between 2007-2008, obviously the historiography of the Civil War expands on a monthly basis, thus some of the “current research” in the paper is no longer exactly current. In July of 1861 the two sides clashed in the first major land battle of the Civil War in the Eastern Theater at Manassas, Virginia. 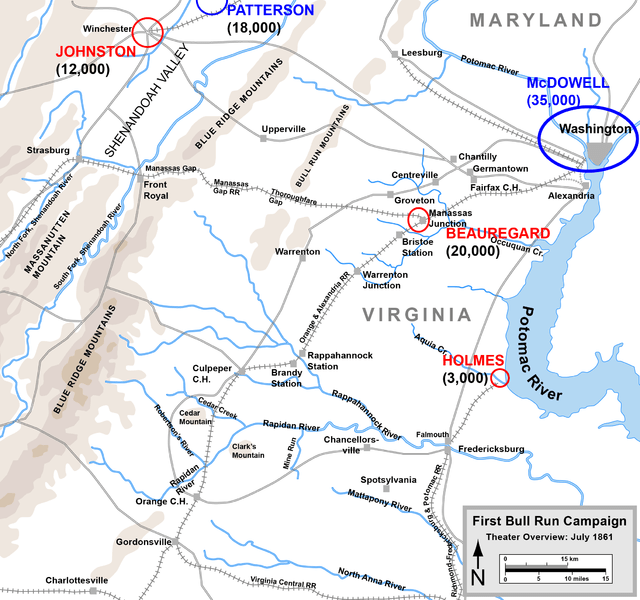 The First Battle of Bull Run was a single day action and a southern victory, but it was also costlier and bloodier than anyone had anticipated. By the end of July 21st, 1861 the United States and the world knew that the war would not be over anytime soon. Southern and northern forces grew as commanders realized the necessity of larger numbers, and both sides readied themselves for what was to come. As both sides built and reinforced armies during this early stage of the war, the focus of the country remained almost wholly in the east. The northern force in the east was the Army of the Potomac, at that time under the command of Major General George McClellan, who referred to his army as “the finest army on the planet.” McClellan organized and trained in and around Washington D.C., the US capital, and basked in the attention of the press and politicians as the “Young Napoleon” and as the “savior of the republic.” The Army of the Potomac sat in and around Washington D.C. from August 1861 to late March of 1862. During this time 120,000 men were mustered into McClellan’s army. Other Union forces in modern day West Virginia and in the Shenandoah Valley of Virginia-both also considered part of the Eastern Theater- also grew to a combined force of over 60,000 Union soldiers. From the Washington D.C. area to the panhandle of modern day West Virginia the Union force was comprised of nearly 200,000 men, not including the Navy in and around the D.C. area. Though he had a staggering amount of men, McClellan’s army did very little until the spring of 1862, when he launched the Peninsula Campaign. This bold campaign was designed to take the Army of the Potomac by ship to Fort Monroe near Norfolk, Virginia. From there McClellan could launch an assault up the peninsula toward the Confederate capital of Richmond. It was bold, daring, and by virtue of its size it overshadowed many important events in the Western Theater of the war. The Peninsula Campaign was, for a myriad of reasons, unsuccessful for the Union cause, and at its conclusion over a year had slipped by in the war with minimal action and no gains for either side in the Eastern Theater. Lincoln supported George McClellan’s push towards Richmond in March and April of 1862. The bulk of men and material were shipped to Washington D.C., so that from there the supplies and men could quickly be deployed to McClellan or to one of the supporting armies. This focus on supplying the eastern armies kept the Union men in the west woefully under-supplied at first. Surprisingly though, the Peninsula Campaign of 1862 did have unseen benefits to the western armies. While the spotlight of war was kept in the east, Northern politicians focused so heavily on the Army of the Potomac’s progress that they often also impeded it. With the Western Theater so far removed for the nation’s capital, politicians and journalists paid less attention to the west, allowing Northern leadership to act with more autonomy and less interference. This was one unintended benefit to the relative ignorance of Easterners to the western progress of the war. In the Western Theater at the same time Major General Henry Halleck was piecing together three armies to cover an area of just over 600 miles; compare this to McClellan’s 200,000 men in the relatively small area around Virginia. Halleck barely mustered 100,000 men to cover this broad stretch of ground. Although Halleck had fewer men, the results Halleck achieved were far more important. With only 24,000 men in February of 1862, then Brigadier General Ulysses S. Grant pushed south and captured Forts Henry and Fort Donelson. Fort Henry sat along the banks of the Tennessee River and Fort Donelson sat on the banks of the Cumberland River; the forts were in close proximity to one another. The goal of the campaign was to secure river routes along the Tennessee and Cumberland. Since Federal forces did not control the Mississippi River at that time, capturing these two smaller routes would allow Union supplies and reinforcements to float to and from their front along the river. The campaign was a stunning success. Grant not only took the two forts, but he also captured the bulk of the Confederate forces in both. The campaign secured the river access as well as 600 square miles of Confederate territory that was never regained by the south. Securing access and control of the two rivers provided corridors of supply and support to future Federal endeavors in Tennessee and Mississippi, a contribution of vital significance to future Union efforts. Compare these gains with the lack of gains being made around that time in the Eastern Theater. A few short months later, April 6-7, 1862 witnessed the first major western engagement between the North and the South. Southern forces attacked Grant’s Army of the Tennessee and Major General Don Carlos Buell’s Army of the Ohio along the banks of the Tennessee River at Shiloh. For two days the battle raged and at its conclusion there were just over 22,000 casualties. Grant was again victorious, but many northern newspaper editors derided him as a “butcher.” Heavy attention on this battle however did not endure long, as the nation soon shifted their attention to George McClellan’s lethargic approach to Richmond. As we have already seen, McClellan’s Peninsula Campaign was a failure, and following it Lincoln transferred Major General John Pope from the west to command in eastern forces, in an attempt to instill confidence in the eastern armies and bring home victories. Pope had been victorious at the Battle of Island Number 10 in early 1862. It was Lincoln’s hope that Pope could come east and bring home a victory on the same scale as those in the west. Pope did not endear himself to his newly formed Army of Virginia and its primarily eastern men, and he alienated fellow officers as well as the common soldier. Pope’s short run of command in the east was put to an end after he was soundly defeated by Lee at the 2nd Battle of Bull Run in August of 1862. These eastern defeats meant more press and public focus on failed Union war aims and the Eastern Theater as a whole. On the Confederate side, one can clearly see from the contrast between their actions in the Western and Eastern Theaters during the first years of the war that the Confederate defensive strategy was a solid plan designed for a prolonged war, yet that it also was flawed. Confederate President Jefferson Davis and many of his advisers believed the Richmond area was the ideal place to harbor troops as well as to base the large Confederate Army of Northern Virginia. Richmond was a tether and the army could only venture so far from home, in an effort by senior Confederate leadership to protect their capital and by virtue, themselves and their reputations. However, while this southern insular focus continued in Richmond, the Union army attempted even more gains out west. In December 1862 Major General William T. Sherman had attacked the Confederate Army of Vicksburg at the Battle of Chickasaw Bayou. Though a Union defeat, alarm bells should have sounded in Richmond, as Vicksburg had obviously become the next major objective in the west for the Union cause. In April-May 1863 the Vicksburg Campaign opened in the west. Vicksburg was a city on the Mississippi River and in spring of 1863 it was the last major link between the eastern and the far western Confederacy. Davis and the war department only placed a pittance of a force-approximately 25,000 men-in and around the city. President of the Confederacy Jefferson Davis. Davis and his military advisers were slow to act to help stabilize the situation at Vicksburg. They modestly reinforced Vicksburg with only 10,000 men from General Braxton Bragg’s Army of Tennessee. Davis also ordered men from Lieutenant General Joseph Johnston’s army, who at the time were amassed around Jackson, Mississippi, to come to Vicksburg’s aid. Joseph Johnston and Davis’ relationship was tenuous at best to begin with, and Johnston refused to reinforce the city; ironically, Davis left Johnston in command although he blatantly defied orders. During the campaign a Confederate division under Major General William Wing Loring slipped away from Lieutenant General John Pemberton’s Army of Vicksburg and marched to Jackson, Mississippi to reinforce Johnston, but it was simply not enough to overcome the Union forces. Grant and his army besieged Vicksburg for 47 days and the Army of Vicksburg capitulated on July 4th, 1863. The Vicksburg Campaign is a shining example of the problems in the Western Theater of the war for the Confederacy. The lack of attention on the Western Theater, where I contend that the Confederacy lost the war, was an issue not only during the early stages of the conflict, but also at this midpoint in summer of 1863. While the campaign and siege was taking place Davis signed junior officers promotions and dealt with angry politicians, while making suggestions to his best field commander General Robert E. Lee on where and when to shift troops in the Fredericksburg, Richmond, and Suffolk areas of Virginia. He and other top Confederate military strategists neglected to comprehend how imperative the war out west would be to their ultimate success or defeat. This entry was posted in Campaigns, Leadership--Confederate, Leadership--Federal, Western Theater and tagged Army of the Tennessee, Army of Vicksburg, Battle of Chickasaw Bayou, Braxton Bragg, Chancelorsville, Eastern Theater versus Western Theater: Where the Civil War Was Won and Lost, First Manassas, Fredericksburg, Henry Halleck, Jackson Mississippi, John Pemberton, Joseph Johnston, Robert E. Lee, Shiloh, Ulysses S. Grant, William Wing Loring. Bookmark the permalink.